[caption id="attachment_226" align="alignleft" width="300" caption="M4A3 Sherman RC Tank"] [/caption] During World War II, the main battle tank used was the Sherman named after the renowned general of the civil war, William Sherman. They are not only popular in history but also in the RC industry. It is used as the basis of the bestselling Sherman RC tanks. Over the years, these RC tanks have evolved a lot making them more enjoyable for RC enthusiasts. They come in varying sizes and most are designed to scale following their real-life counterparts. With innovation in RC technology, you can now find hobby-grade tank models that have turrets equipped with the ability to move up or down and turn at an angle of 360 degrees. You can also change the climbing gradient depending on the road surface. Most of the models that you can find in stores have sound effects similar to that of machine guns, can fire plastic BB ammo, and smoke from their turrets upon firing. With all these amazing features, modern RC tanks are made more realistic. The radio controls are used in moving RC tanks forward and backward as well as climb steep slopes and terrains. The models that you can find today are mostly made of a combination of plastic and metal parts. The professional versions are usually upgraded with tracks made of metal and rubber treads making them appear very realistic. Moreover, the details like metal gearbox, guns, sounds, markings, and figures of commanders in the tank hatch make them look just the same as the genuine tanks used in a real battle. It is common for RC tanks nowadays to engage in mock battles with other tanks. This is made possible by choosing a different channel from the ones that you going to play with. 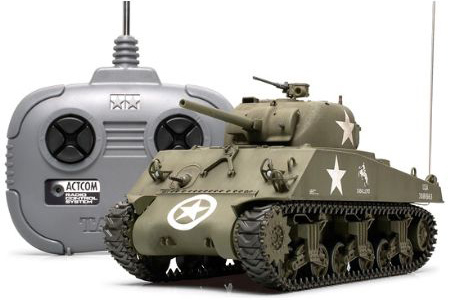 Most RC tanks come with radio controllers in pre-select channels and they run on 27 MHz to 40 MHz normally. An important point to consider when buying RC tanks is the availability of accessories and parts so that you won’t have much difficulty in finding BBs or smoke refills. There are also smaller versions that would not require too much cash to be spent for entry levels. Take note that the BBs fired by Sherman RC tanks can hurt if you or anybody within shooting range is hit. Safety measures must be observed when kids or even adults use these tank replicas for fun and play. You can find models that need to be assembled if you are the type who finds gratification in playing with something that you built yourself. But if you want ready to run models, they are also offered and sold in local hobby/toy stores and web shops. If you want to find quality Sherman RC tanks, you can search the online marketplace or your local hobby shops. A lot of sources can offer you RC tank models suitable for beginners and experts alike. A little research would help in finding the model that would meet your specifications as well as in getting a kit that would your budget can afford.